Bjelde, A, Disser, Y, Hackfeld, J, Hansknecht, C, Lipmann, M, Meißner, J, … Stougie, L. (2017). 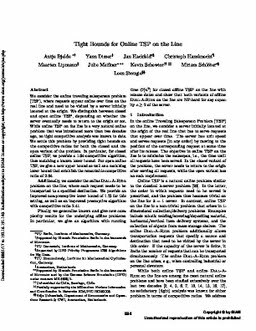 Tight bounds for online TSP on the line. In Proceedings of the Annual ACM-SIAM Symposium on Discrete Algorithms (pp. 994–1005).